It was my last day on this trip and in New England. Sigh! I had really enjoyed myself. I had a good trip with very few problems except for the holidays and a little blip at Bristol. On the whole I had a good time! The chore today was packing my suitcases. Having several breakfasts and lots of coffee. The packing went remarkably well. I was done in no time. The biggest chore was taking it all downstairs. Fortunately I was now down to two suitcase, my computer case, and my photo bag. A lot better than when I came in. Checkout was easy and quick. It was sunny outside. Can you believe it. After all that rain the day before it was actually nice weather. So that means I can be outside without a problem. 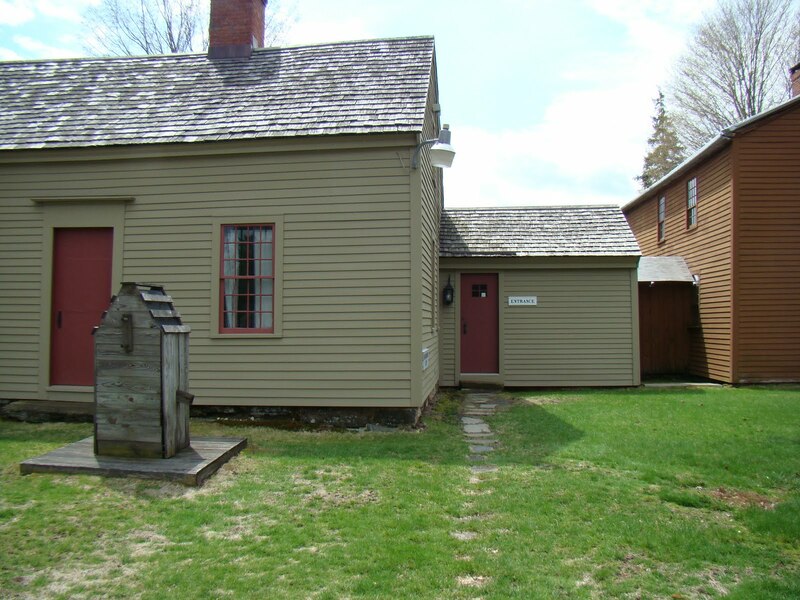 Therefore, I will revisit the cemetery and the historical society. I started taking my possessions down the stairs and the lady who I believe was the head host offered to help with the big suitcase. She grabbed on end and walked it down. They really don’t have valet service so you may have to ask for help? No elevator. She helped me check out. I gave her a brochure of my trip. 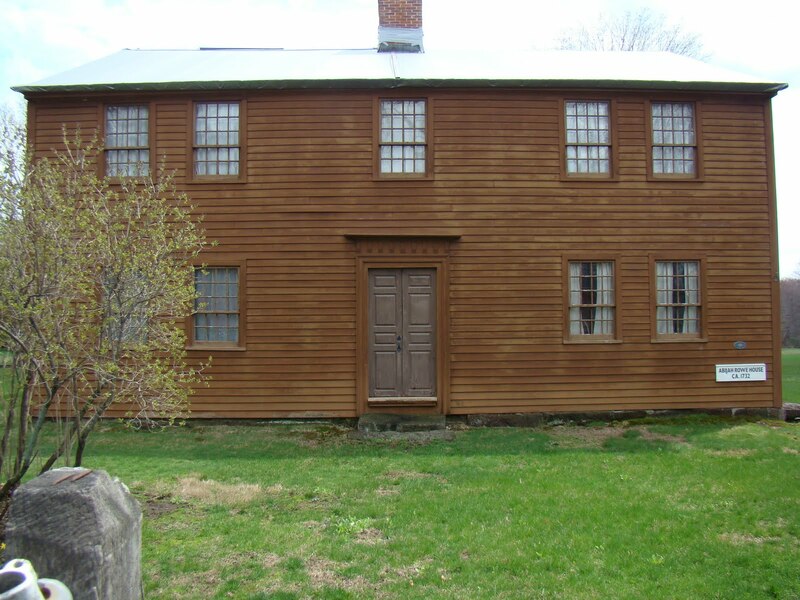 My stay at the Simsbury 1820 House was very pleasant. There is a brochure: Hopmeadow Walk. 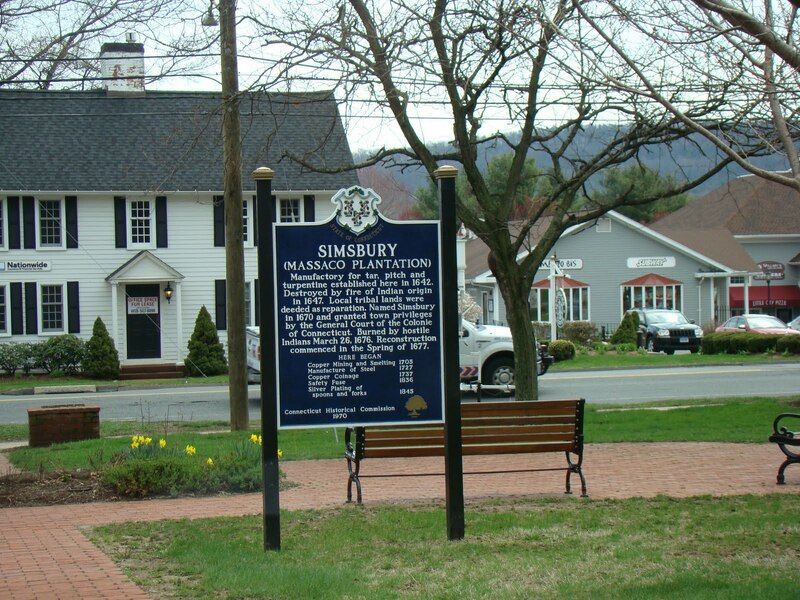 Mine is from the last time I visited so you might have to check out the Town of Simsbury website and the Farmington Valley Tourism for additional information. 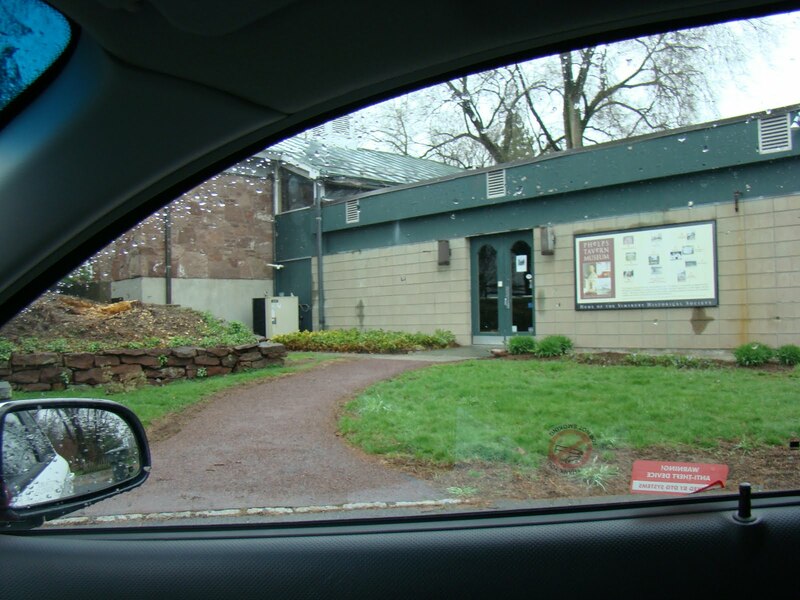 Off I went in my Aveo first to the historical society to revisit it. I parked in the circular drive and studied the help center. The tree had been removed. I walked up and peered into the windows and it was certainly filled with boxes and things scattered everywhere and not ready for any visitors. Definitely closed. I could see damage on the gutter area and probably more inside on the roof. So I decided to walk the historical building area. I had not done that before. There were quite a few buildings with signs on them explaining what they were. I peered in a few windows and noticed carriages and other displays. They are at the end of Railroad St. but watch out some of the streets are one way so you need to look for others to access this area. I turned onto Wilcox and drove a block. That seemed to work. You do pass Plan B. They have all their hardware stores in this area. Off to the cemetery to see if this time with the weather being much nicer find the Viets individuals I was seeking. 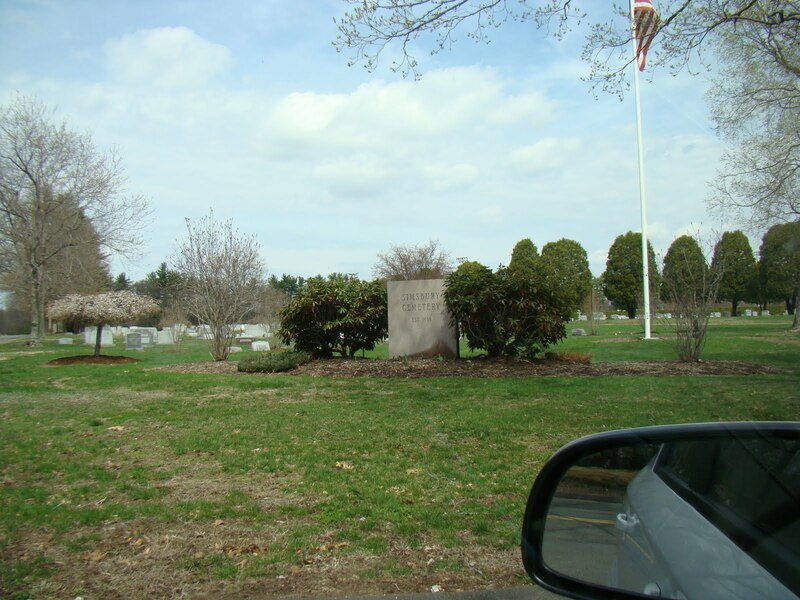 This cemetery photo was from Phelps St? 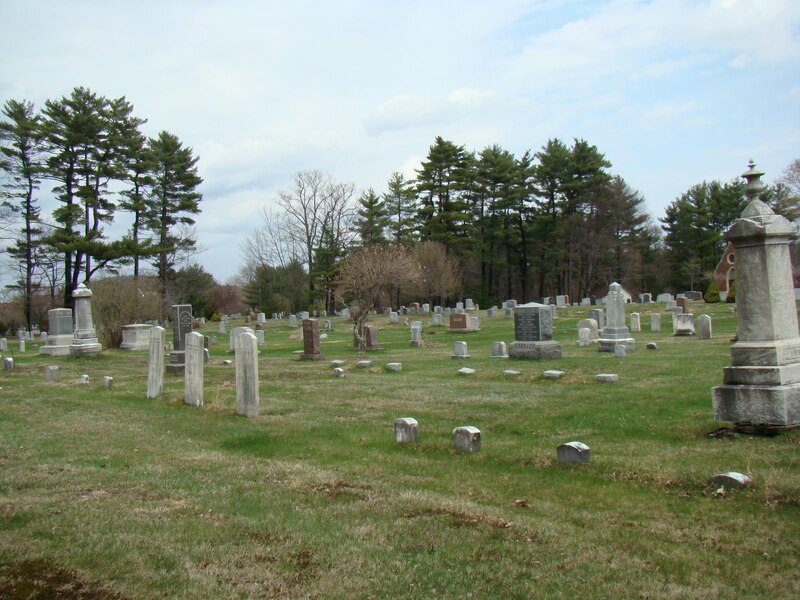 This is the Simsbury Cemetery. Someone at Find A Grave had it under the title Hopmeadow Cemetery. I entered again at the left side were the road was and parked the car. I headed over to section B and started looking again. I found them right there in about the 3-4 the row. Silly me! John Viets on the right and Catherine his wife on the left. Catherine Meyers Viets b. 1679 New York, d. Mar. 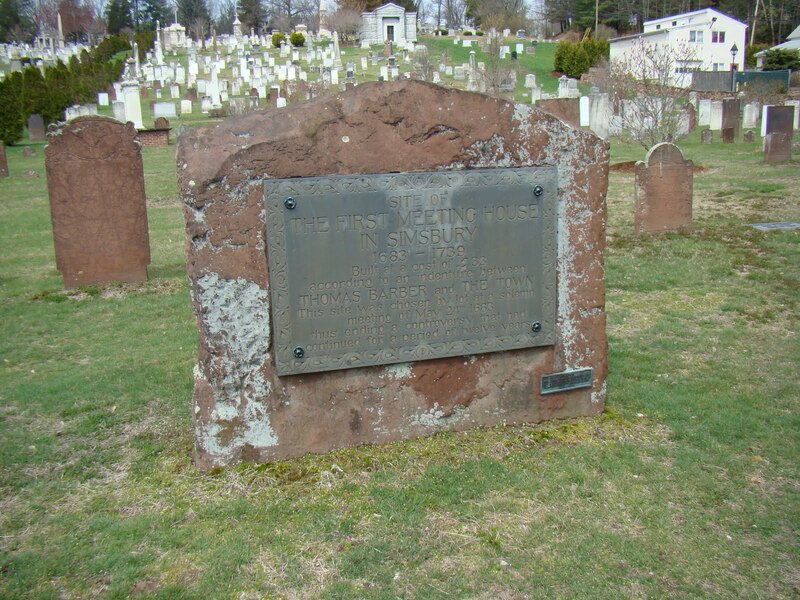 6, 1734 Simsbury, CT. Tombstone says Catron Vets. Paul H. Goss and Edith Blake Bartlett Sumner got in a big controversy over the marriage of Philip Goss IV (1724 to 1778). 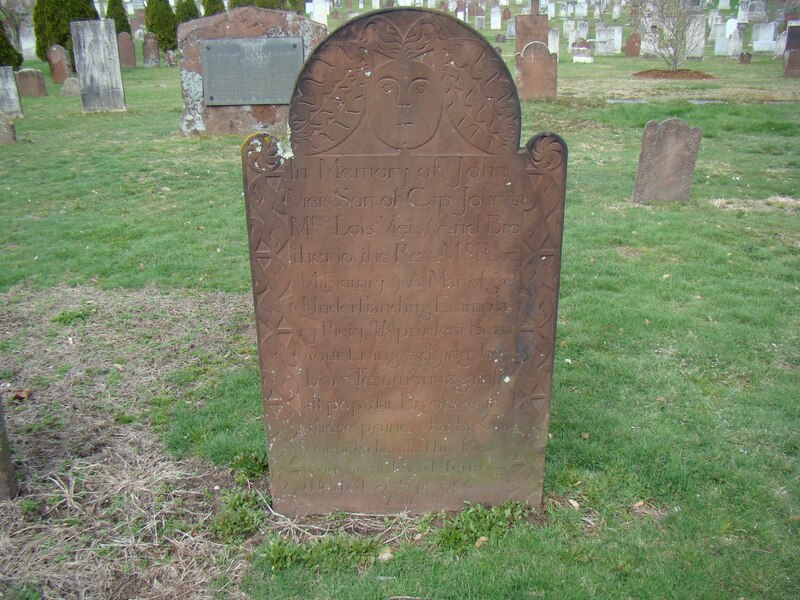 There was a Mary Viets who married a Goffe in the records. The website I give as a highlight of John Viet’s name has for one of this couples children a Mary Viets. If you click on it you see that this Mary Viets married an Ephraim Goff and the whole genealogy of this Mary goes in a totally different direction. Another source is the Genealogy of the Viets Family at Internet Archive and on page 20 it shows that Mary Viets married a Goff. I found this absolutely fascinating! Ms. Sumner apparently was reaching. 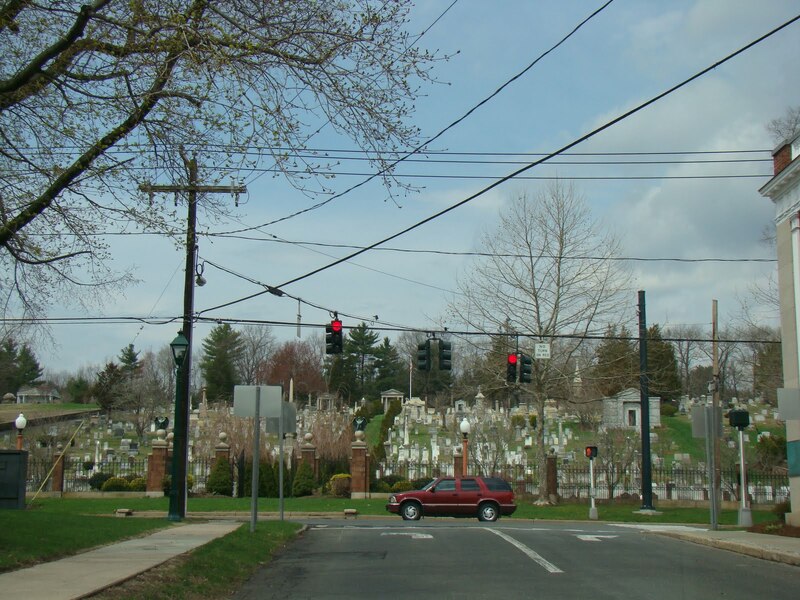 I drove up the hill at the cemetery and over to the street and low and behold I discovered another cemetery on the top of the hill. 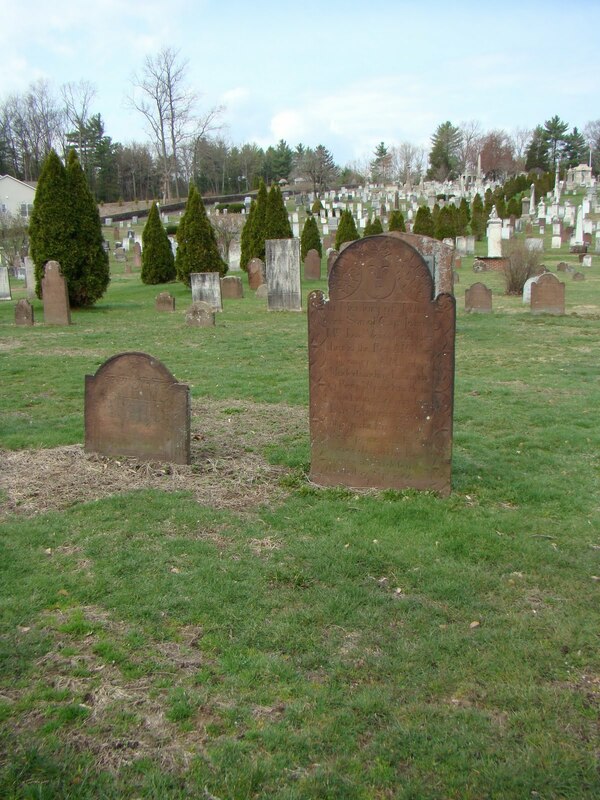 The sign said Simsbury Cemetery. So what was the name of the one near the main road? 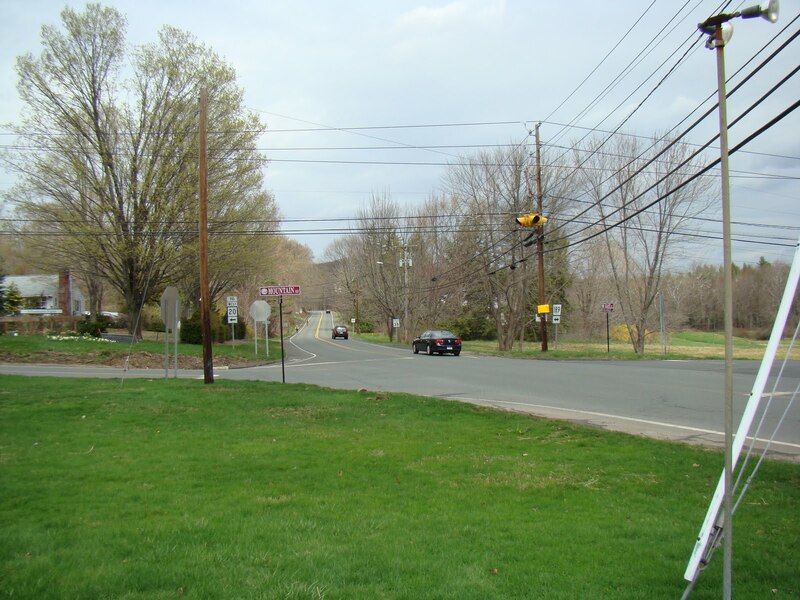 My next goal was to find Wolcott Street which was in the north area of Simsbury. I did get curious when I saw a catholic church with people gathered. It was Easter Day. 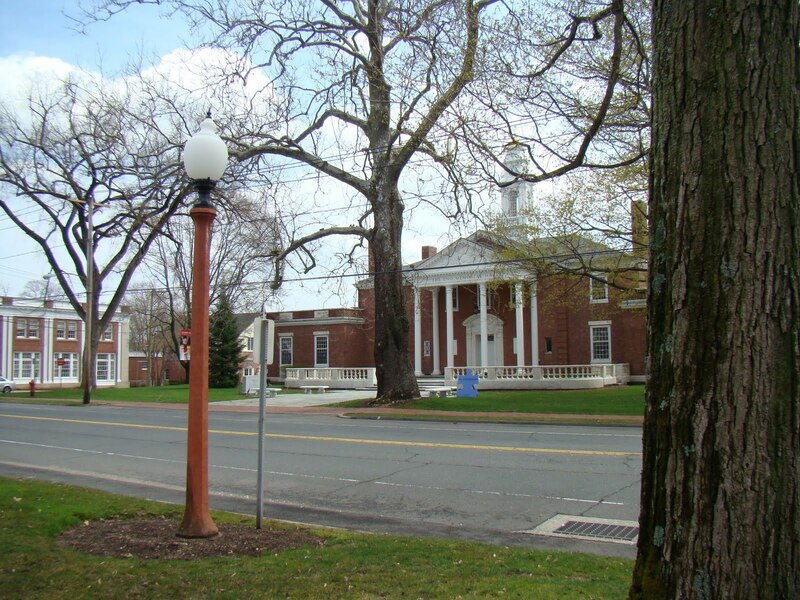 Is this the town hall?? This building looks like a castle. I could not tell if it was the town hall there was a sign for a school on it. There was a sign out front about governmental buildings. According to Google Images it is! 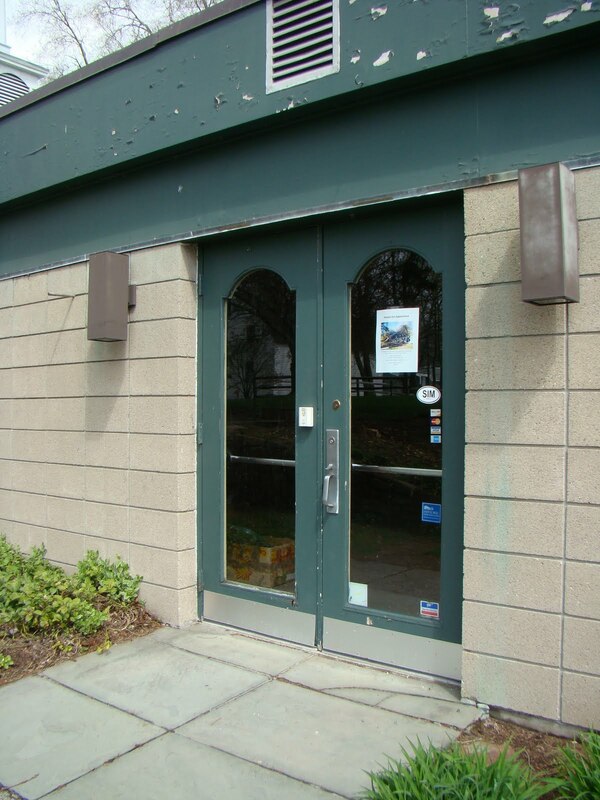 Off I went on highway 202/10 north passed the Iron Horse Inn which was very modern looking. 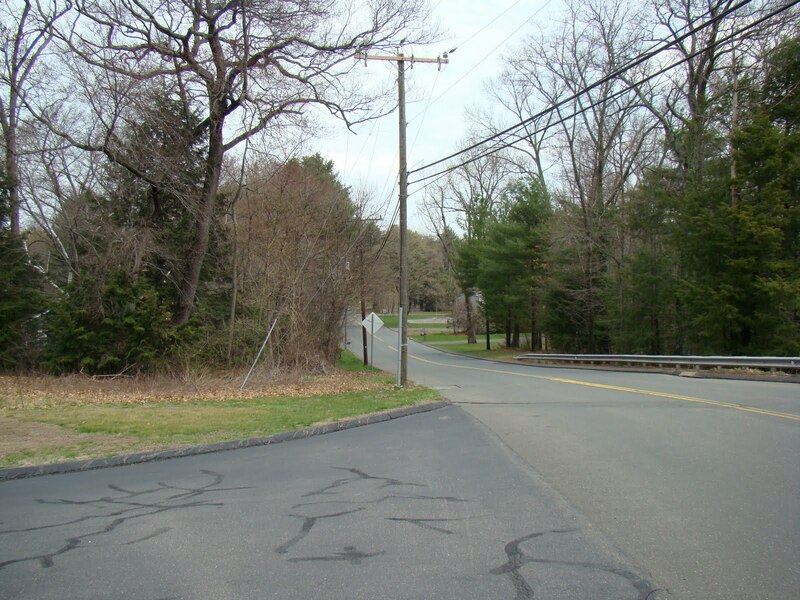 I passed the Tariffville road and came to Wolcott Rd. 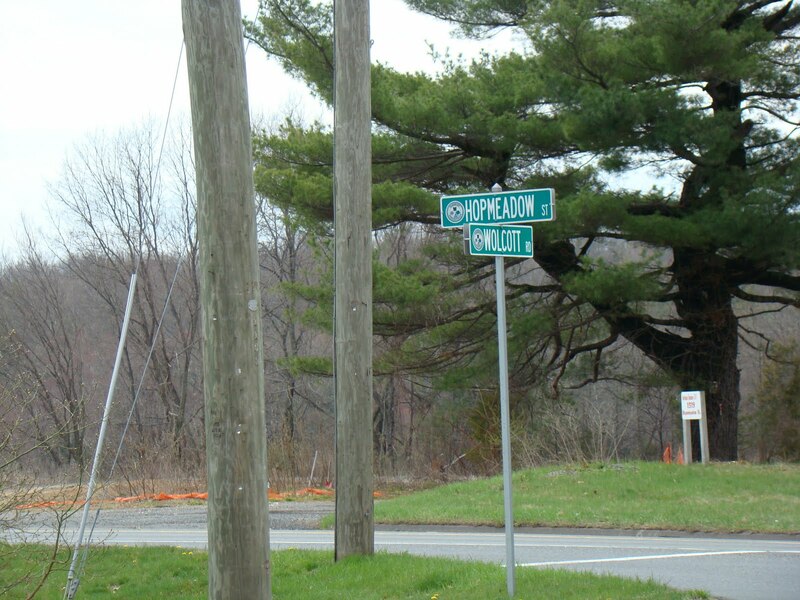 Was Simon Wolcott’s land nearby??? 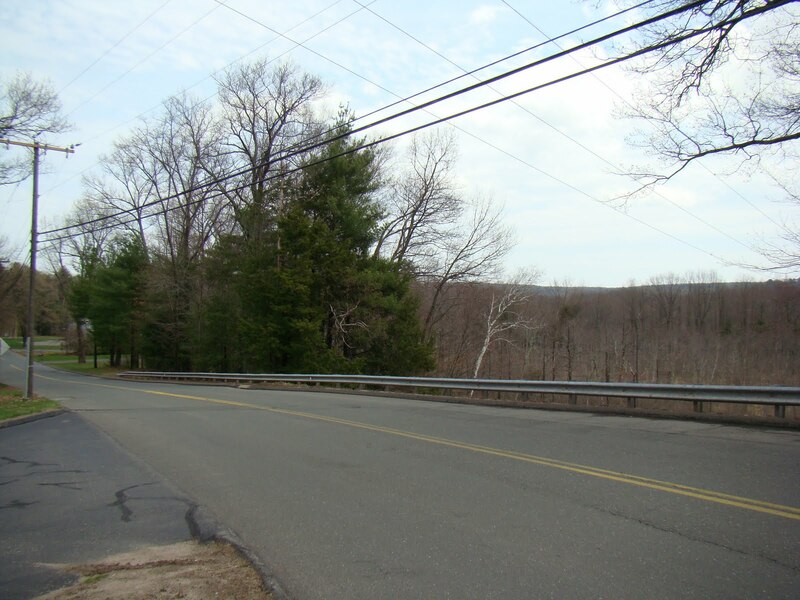 I traveled down the road a ways and pulled into an area called Wolcott Woods. It was either apartments or condos. I was trying to figure things out when a car came up behind so I took off to get out of the way. I came to Hopmeadow and stopped and was carefully checking the road an not paying attention to the light. I got honked at. So I turned onto Hopmeadow and pulled over to let him buy. He flipped the bird at me and honked. I admit was in the wrong but this is stupid. He was down the road in a second a good distance from me. Scarry drivers! 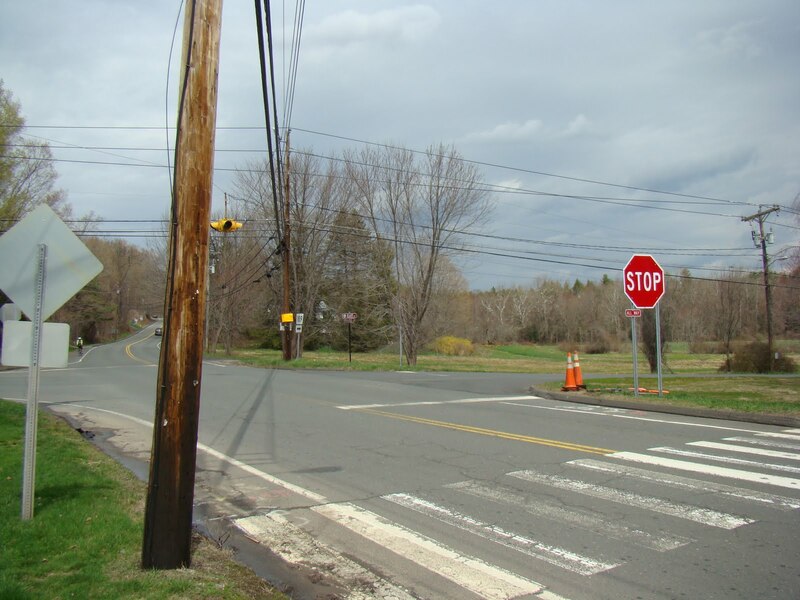 If you keep going on Hwy 202/10 you eventually come into Granby and the road’s name changes to Salmon Brook St. 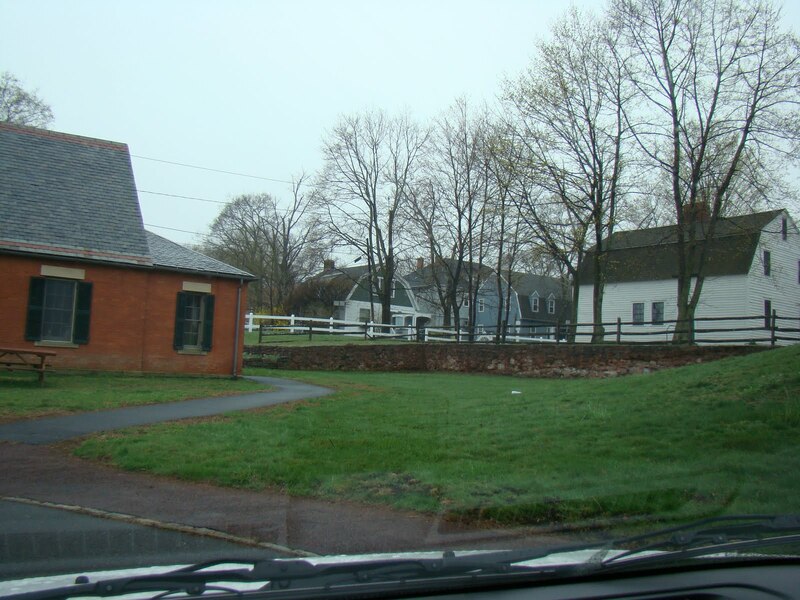 The Salmon Brook Historical Society is just past Elmwood Ct. and at the next turn called Meadow Gate Road. You can’t miss it for there is an historical sign out front. If you pass the entrance to Salmon Brook Park you have gone to far. 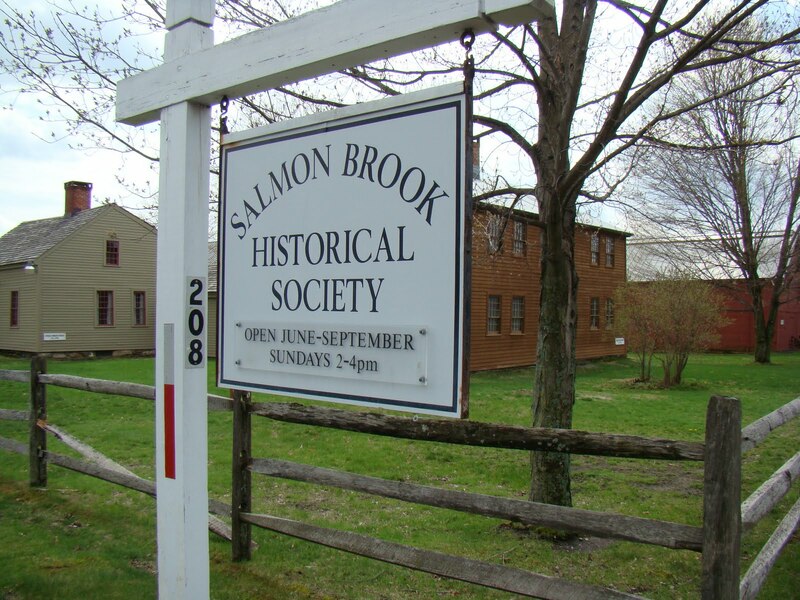 Now I have visited the Salmon Brook Historical Society on my first trip to this area. I had made an appointment with Carol Laun the curator. When I arrived they were gathering volunteers to do clean up or other chores, so frankly I think she was diverted. I did get some leads from her on church records which are at the Family History Library and she had missed other information in the film? I did get idea from the deeds I had for Philip Goss where his land might be. There was another man there who was knowledgeable about the area. He helped a lot with the deeds. This was a situation in which you need to be really clear and specific about what you need. I know there are more treasures in this archive. I did purchase the new history book: Tempest in a Small Town and found the first part of the book interesting. Entrance to the research area unless it is now in the new red building? 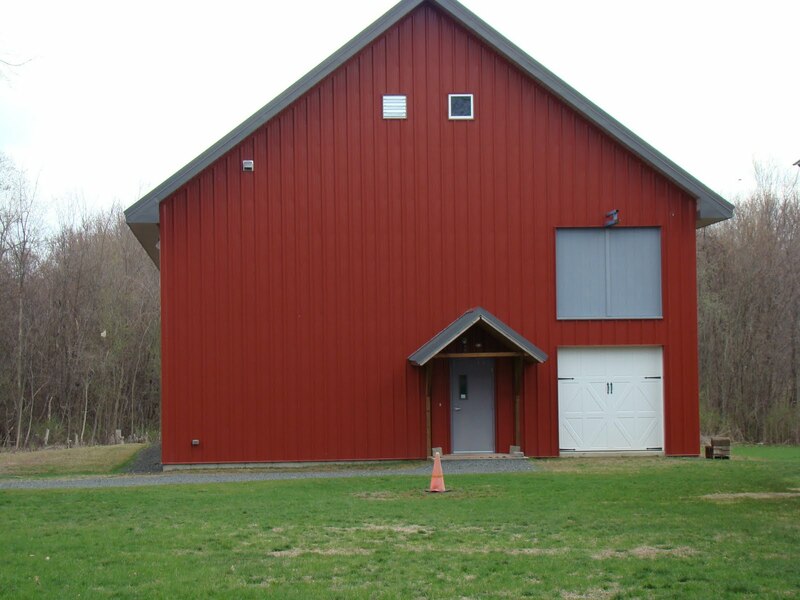 This is their new archive building to house their treasures. This time I was just going to enjoy the buildings and take some photographs. I peered in the window of this one but didn’t see anything except for a meeting room. Darn! On their website they do have a list of genealogies. Now my next destination was North Granby. 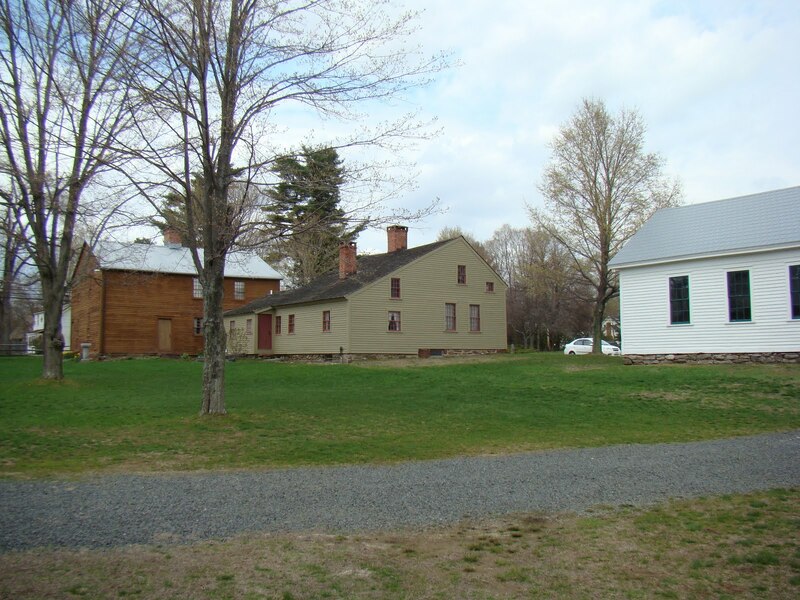 I found this online Self Guided Tour done by the Salmon Brook Historical Society that is really cool. 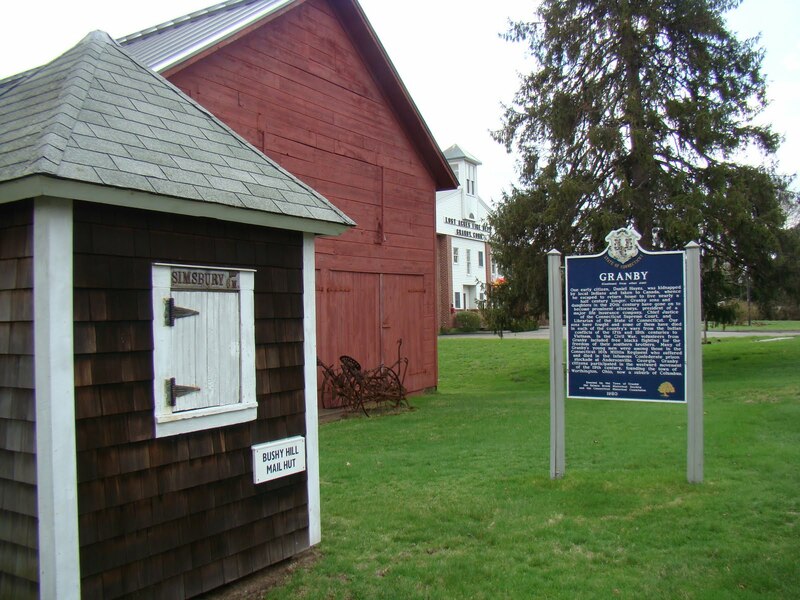 It has a map and then it gives descriptions of the numbers on the map of historical sites in Granby, North Granby and West Granby plus other areas. Doesn’t do East Granby. Don’t forget to get the map by clicking at the top. As I was heading up Hwy 202/10 I came to the familiar intersection of 189/202/10 and 20. 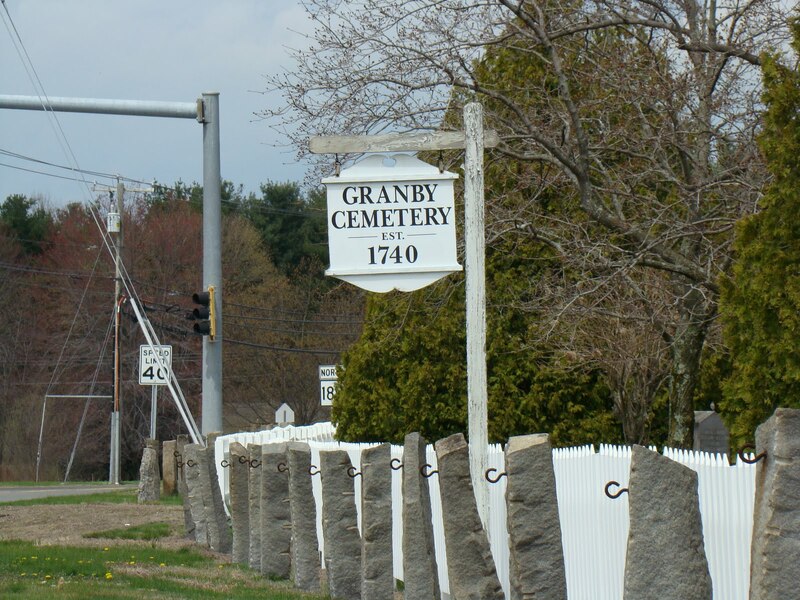 I turned to the left and headed up Hwy 189 and immediately spotted the Granby Cemetery. I just had to take a quick trip through. It is out on the flat and open area. There is a lovely chapel in the back. The roads are gravel like but easy to drive on. 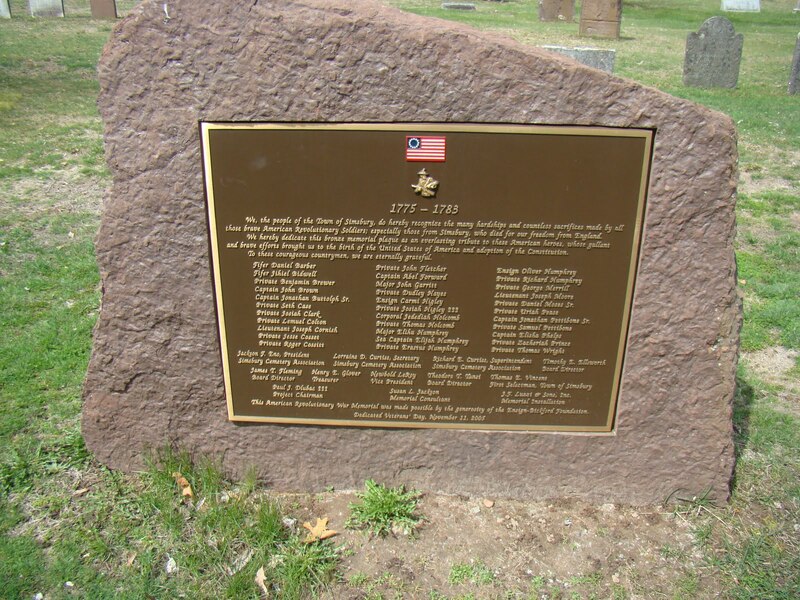 This cemetery is at Find A Grave and also in published book form through the Salmon Brook Historical Society. No Goss are buried here! I continued up Hwy 189 and began to realize that I had used this highway before. 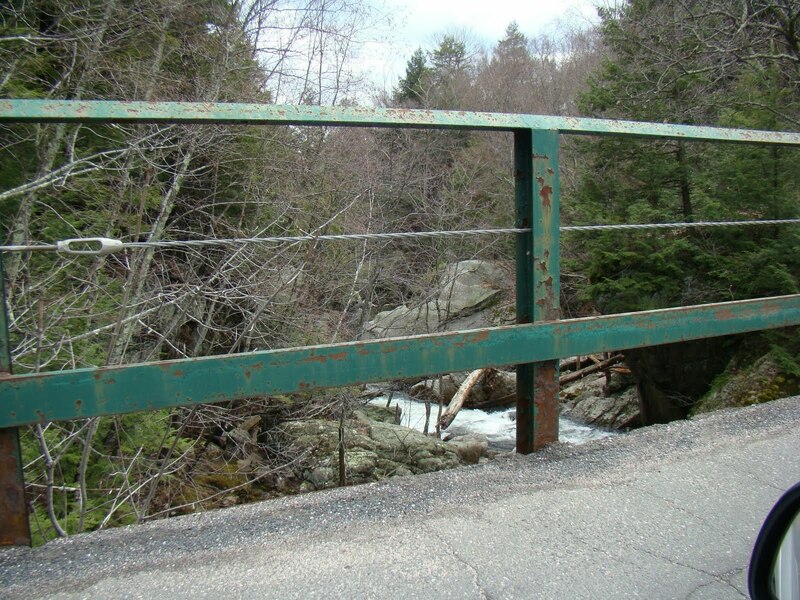 I had driven down it from Granville, MA when I visited the area before. 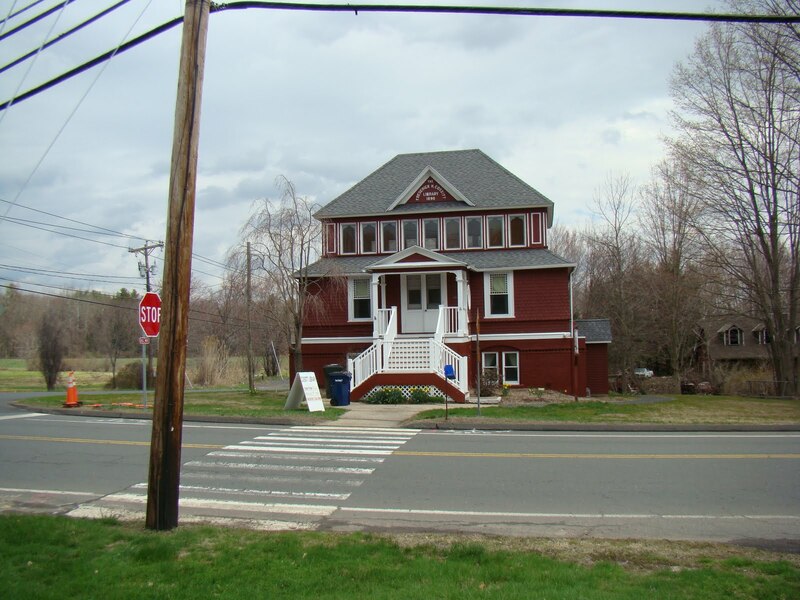 The road becomes N. Granby Road. Side streets read Mechanicsville Rd., Creamery Rd. 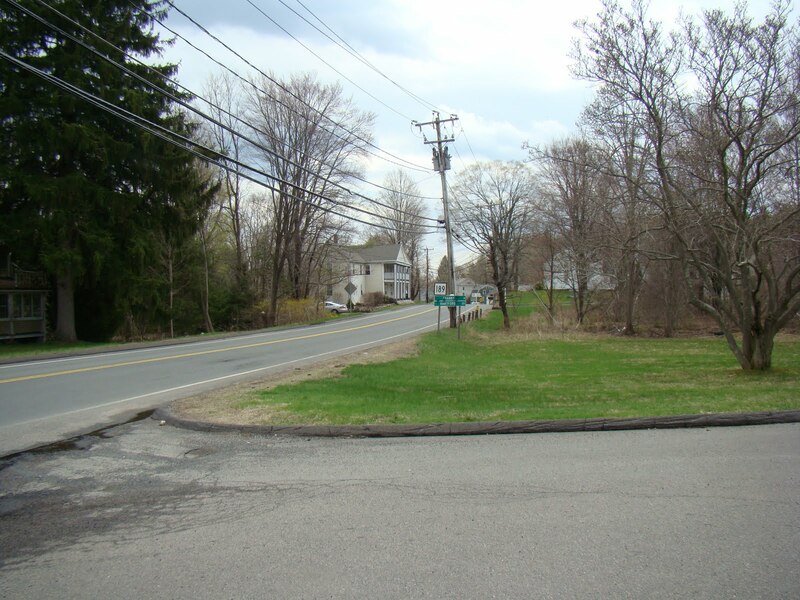 North Granby is an intersection at Mountain Road, Hwy 189 which is still the N. Granby Rd. but once it crosses Mountain Road is becomes the Granville Rd. On the other side of Mountain Rd is East St. If you drive it you come to Cooley Rd. on the left. The highway sign reads Granville 6 miles. HA! So if Philip Goss’s land was in this area west of Cragg Mount which is on the east of Hwy 189 and north of East St. 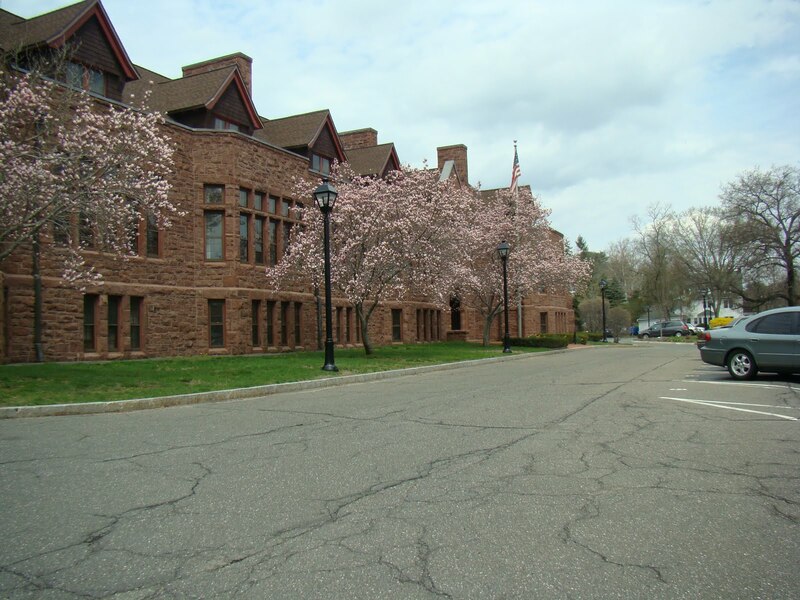 This is according to the descriptions in the Simsbury deeds that Paul H. Goss discusses in his manuscripts. Now I need to get more specific but I wanted to get a general idea of the land in this area. The land next to Hwy 189 on the east side after Mountain/East Rd. is a ravine with a creek running through it. I drove up to Silver St. and tried to get off the road and away for this truck but he turned right with me. Darn! There was a bridge and all of a sudden there was another car taking this road. 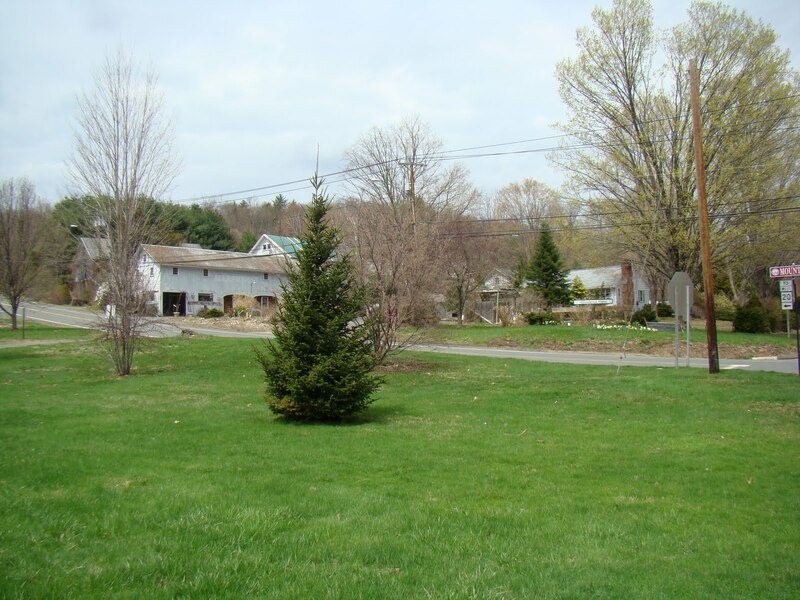 These photos won’t mean much but I tried to get a little bit of what North Granby looks like. The stream and the gorge along Cragg Mt. In order to understand the area better I think we need to study Google Earth. Give me a little time to do that. Now I can’t let this go but go to a map and study the location of Barkhamsted, North Granby, Granville and Becket and then you see that the Goss family was not that far from each other. Add Otis and Peru and the geography gets interesting. Now granted it took them longer to get to each other than a modern road and car? Ponder, ponder! Time to head to the airport! 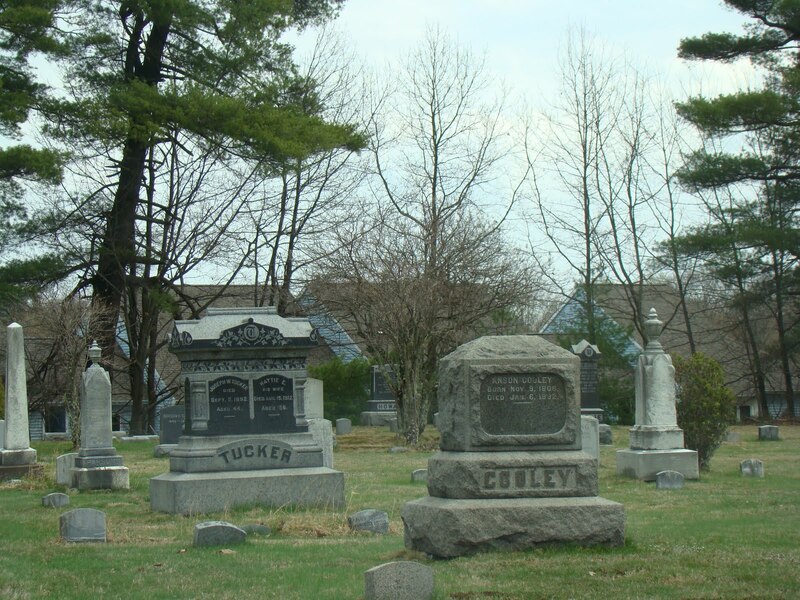 The Header photo is the cemetery in Hardwick, MA 2011. -------------- I recently joined Find A Grave and will be posting my photos on that website. 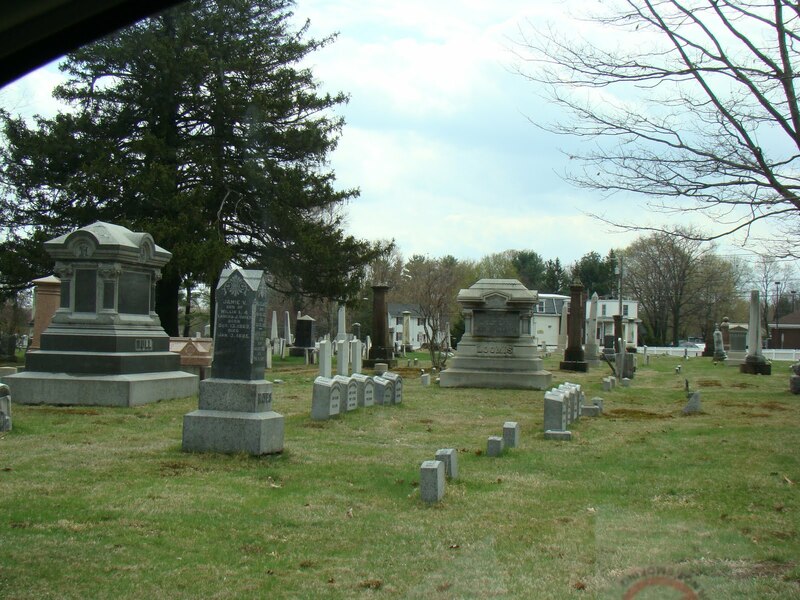 I do write about my visits to cemeteries in my blog BJM Cemetery Discoveries but I wanted to put them where they would be preserved as well.